There are several sessions that look interesting at this year’s ATA Conference. 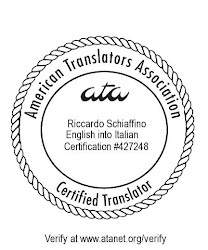 The Italian division, in particular, will be very active, with two presentations on literary translation by special guest Tim Parks and a couple of interesting sessions on English to Italian legal translation. You can find a list of all the scheduled sessions from the Conference’s preliminary program. If you are interested, older versions of both presentations are available from this blog (see the tabs above). I won’t post the most up to date version until after the conference. If you are going to the 52nd ATA Conference (Boston, October 26-30), but are unsure what to do (because it’s the first time for you), Jill Sommer has just posted a very useful QA session. See you in Boston, Ricardo!